Two new studies suggest that gentle stretching and meditation exercises, such as some forms of yoga and Tai Chi, may help those that suffer from Fibromyalgia. 58 women were enrolled in the yoga study. 25 of those participated in a two hour yoga class once a week, for eight weeks. The class was designed specifically for women with Fibromyalgia, and included gentle stretches, poses, instructions on coping with fibromyalgia, and group discussions. The remaining 28 women were told they were on a waiting list, and served as a control group. At the end of the study, 4.5% of the participants said they felt “very much better”. 77% said they were “a little better”, 4.5% reported no change. In the control group, none reported “very much better”, 19.2% reported “a little better”, and 38.5% reported no change. The study was published in the Oct 14th issue of the journal “Pain”. In August, a study published by The New England Journal of Medicine found that the slow and meditative practice of Tai Chi can be helpful to women with Fibromyalgia. Tai Chi is an ancient art form, rooted in the practice of martial arts such as Kung Fu, but done slowly and with a focus on the health benefits rather than fighting. 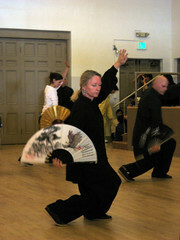 Participants took two Tai Chi classes each week, and received a DVD to practice with 20 minutes each day. Compared to a control group, which participated in a stretching and education class, the Tai Chi students demonstrated more weekly improvement using the Fibromyalgia Impact Questionnaire, according to the studies authors. One-third of the Tai Chi students stopped using medications during the course of the study, compared with one-sixth in the stretching/education group. Researchers noted that both studies were small, and that more research was needed with larger numbers of participants and different instructors, to see if successful ratios held up. Fibromyalgia is a debilitating condition. Symptoms include tender and painful points on the body, fatigue, insomnia, anxiety, depression, and memory and concentration problems. It is difficult to diagnose and treat, many patients receive little or no relief from medications. It’s estimated that 12 to 15 million Americans suffer from Fibromyalgia, 80 to 90% of them women.